Luxury 3 bedroom Penthouse in Puerto Banus, Marbella. If you are looking for a luxury Penthouse in Puerto Banus. Located in the best residential area of Nueva Andalucía, in the heart of the “Golf Valley ” and only a few minutes walk from the exclusive Puerto Banus marina. 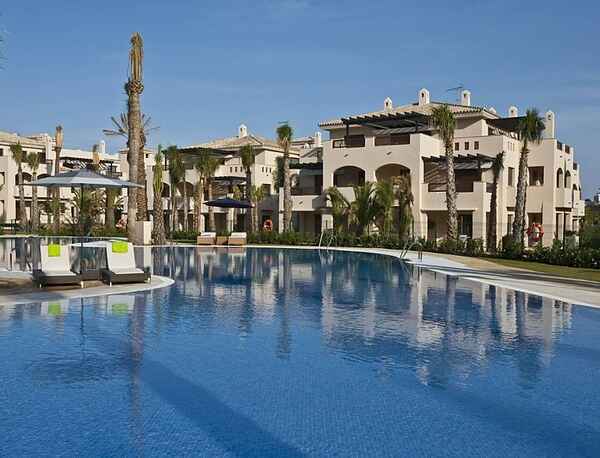 La Medina de Banus is created in the style of an old Mediterranean town there are only 150 units situated in luxurious mediterranean gardens and a 600 sqm. sized swimming pool in the centre. A brand new executive penthouse furnished to a good standard in an idyllic peaceful location in Puerto Banus. The executive property offers luxury accommodation containing a range top quality furniture and fittings. It will feel as though you are home from home, the kitchen is fully fitted with everything you will need, the furniture carefully chosen for your comfort. The very best marble has been used in the main areas of the property such as the hallway, living room and bedrooms. The kitchen worktop are stainless steel. Appliances installed are of the highest quality. 2 Bathrooms (one on-suite) - whirlpool bath, hydro massage column in the shower and twin hand basins. Both bathrooms benefit from underfloor heating too. White goods - cooker, hob, microwave, dishwasher, washing machine/dryer are all installed. Security - Gated urbanization with security guard and dedicated underground parking. Puerto Banus not only has a world famous marina and beautiful beaches but lots of exclusive shopping and restaurants to enjoy. Having a property in walking distance to all this is really a dream come true and not to be missed. The nearby town of Marbella is also close by and a great place to visit. Given that La Medina de Banus is not only located in the best residential area of Nueva Andalucía but also right in the heart of “Golf Valley" there are great opportunities for golfers of any age and standard. Within walking distance to everything you need during your holiday. Famous clubs and beaches like Ocean Club and Plaza Beach & Hotel are in the near surroundings. Aloha has Centro Plaza with high end designer stores, beauty salon Reflections for hair nails and skin care & a nightclub, some bars and restaurants and cafes. Enjoy a meal at one of the many restaurants before visiting bars and nightclubs. For example: La Sala restaurant & lounge bar is very popular and fancy. The El Jardin lounge bar. Italian restaurant. Just a quick drive from Oliver Valerie and Thinka Basaya Restaurant & night disco. Walking distance to Mercadonna & Open Cor supermarkets (lastnamed is open 24 hours) and the pharmacy. La Guinea, Los Narajos: 20 minutes walking to Puerto Banus Marina: 15 minute drive to Marbella city center. Prices are based on 6 persons. We inform you that we gladly arrange a baby cot and high chair for you. The total cost for the entire stay is Euro 30 including bed sheets. Ask the office. If you require changing of bed sheets and towels during your stay please do advise us when you make a reservation. The price is Euro 12 p. person. Ask the office.